Seagrass beds vary in patch size and shoot density, which can influence the distribution and abundance of nekton responding to habitat structure. In Washington State, USA, eelgrass (Zostera marina) occurs under two distinct shoreline slope conditions: shallow tidal flats where eelgrass forms extensive meadows, and steep slopes near channels where it forms narrow, often patchy, fringes adjacent to unvegetated sediment. We sampled nekton in these naturally occurring habitat mosaics with a crossed design: unvegetated, edge, and interior eelgrass (habitat) in flats and fringes. Multivariate community structure showed additive effects of habitat and slope, while aggregate body size did not vary across habitat, shoot density, or slopes. Total nekton abundance responded to structure on fringes (interior > unvegetated; edge = unvegetated; and interior > edge) but not on flats, while half of the most common taxa showed a significant habitat-by-slope interaction in abundance. Diversity and species richness were greater in fringes than flats, irrespective of habitat type. Since canopy height and shoot density did not differ significantly between fringes and flats, it is unlikely that fine-scale aspects of vegetation structure explain why fauna responded differently to eelgrass fringes and flats. We instead attribute these different responses to underlying differences between fringes and flats in within-habitat heterogeneity and connectivity to deeper habitats, as well as species-specific responses to greater edge/interior ratios in fringing beds. 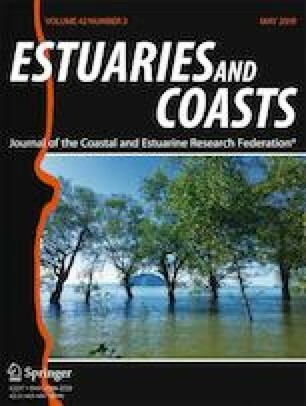 Our study shows that topographic and seascape heterogeneity as well as habitat connectivity may play key roles in the value of nearshore estuarine habitats for nekton in the Northeast Pacific. The online version of this article ( https://doi.org/10.1007/s12237-019-00556-8) contains supplementary material, which is available to authorized users. Help in the field was provided by J. Borin, S. Valdez, and P. Markos. We are grateful to the Skokomish Tribe for granting access to their territory and local eelgrass beds. The manuscript was improved by comments from A. T. Lowe, L. Harris, M. S. Turner, J.J. Stachowicz, and three anonymous reviewers. This project was supported by Washington Department of Natural Resources through an interagency agreement with the University of Washington (IAA 16-19) and by Washington Sea Grant Program, pursuant to National Oceanic and Atmospheric Administration Award NA14OAR4170078. The views expressed herein are those of the authors and do not necessarily reflect the views of funding agencies or sub-agencies.